Try your hands at Bo Bo Cha Cha – The Peranakan sweet soup that’s as colourful as a rainbow! 1. Cut the yam and sweet potatoes into bite size cubes and steam till cooked (about 10 mintues), set aside. 2. In boiling water, boil sago until translucent and cooked, drained and set aside. 3. 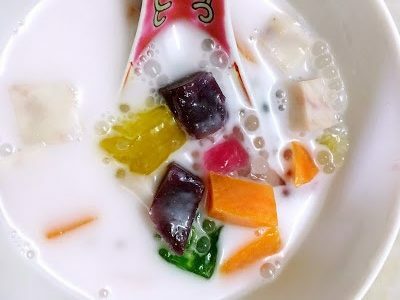 In boiling water, boil the tapioca jellies until translucent and cooked, drained and placed in cold water to prevent them from sticking together. 4. In a separate pot, boil water and sugar and toss in the knot pandan leaves. 6. To serve, put pieces of yam, tapioca, sweet potatoes in a bowl. Ladle the coconut soup over it. Please feel free to adjust the ingredient portion to your preference. Do check the sweet potatoes, yam are not over cooked.